How Do You Multiply a Two-Digit Number by a One-Digit Number? Multiplication is a building block of math, so it's important to be comfortable with it! 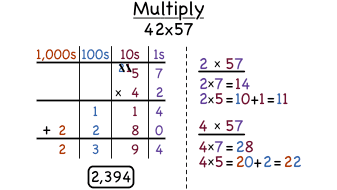 This tutorial gives you practice multiplying a one digit number by a two digit number. How Do You Multiply a Two-Digit Number by a Two-Digit Number Using Partial Products? You can use partial products to help you multiply two numbers together! Follow the steps in this tutorial to see how partial products can make a multiplication problem easier!